Heat the oven to 375°. Put the pitas in a single layer on a baking sheet and toast in the oven until brown, about 12 minutes. Let cool. Light a grill or heat the broiler. 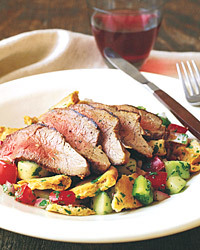 Coat the lamb with the 1 tablespoon oil and season with 1/4 teaspoon of the salt and 1/4 teaspoon of the black pepper. Grill over moderate heat for 10 minutes. Turn and cook until done to your taste, about 10 minutes longer, depending on the thickness, for medium rare. Alternatively, broil the meat, 6 inches from the heat if possible, for the same amount of time. Transfer the lamb to a carving board and let rest for 10 minutes. Carve into thin slices against the grain. Meanwhile, in a large glass or stainless-steel bowl, whisk together the lemon juice, garlic, and the remaining 3/4 teaspoon salt and 1/4 teaspoon black pepper. Add the 1/3 cup oil slowly, whisking. Add the tomatoes, cucumber, bell pepper, scallions, onion, mint, parsley, and pitas. Serve topped with the lamb. The great red wines of the Loire Valley are made almost exclusively from Cabernet Franc, which imbues them with strawberry aromas, cassis and berry flavors, and a distinct leafy note. It all adds up to a fabulous match for this salad. Go for a young Saumur-Champigny or Chinon.